The internet is a goldmine of information, so start by seeing what examples you can find. There are traditional vows, religious ones and more modern alternatives, so see what resonates with you. You can incorporate the themes and ideas into your own words or simply use them as a starting point for creating your very own original vows. This is a joint effort, so format and tone need to be agreed upon. Do you want something that is comic, poetic or deeply romantic? You’ll also need to decide whether you are going to write separate vows, write them together and will they be the same or different from each other? Will you be sharing what you’ve written or save it for a surprise on the big day? What challenges have you faced together? Yes, they are important but concise and beautiful is what you’re after. For others to enjoy your vows too, they mustn’t drag on and become over self-indulgent. Make the most important points and if it runs longer than two minutes, you might need to do some editing. If you have lots to say, put it in a letter for your partner to read on the morning of the wedding and leave other fun topics to the toast. Remember the vows are a public declaration that you want your guests to enjoy and engage in. Things like code words, nicknames, highly personal anecdotes or inside jokes should not be included. 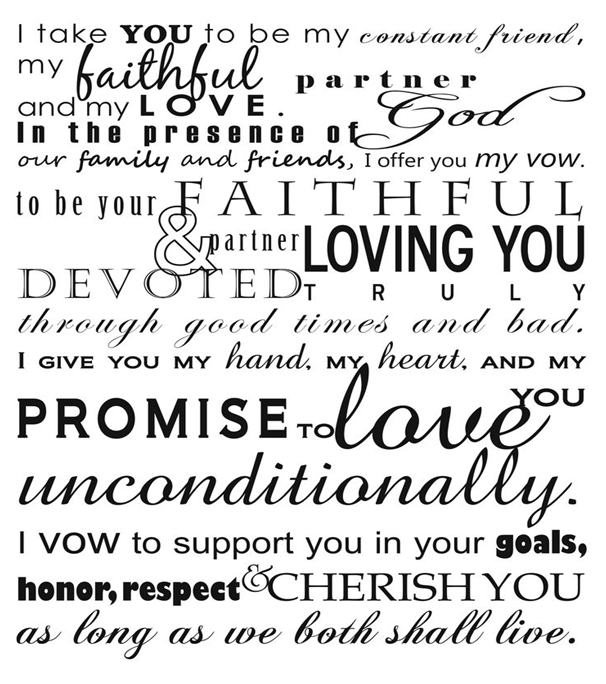 The ceremony will most likely be recorded, so think about how these vows will sound to others and to you in the future. You might feel silly, but this is the best way to familiarise yourself with the wording and how it sounds. It’s a good way to pick out any potential tongue twisters or awkwardly written phrases. It will also help reduce any nerves on the day itself. ← Previous Story AI: Is the UK Leading the Way?